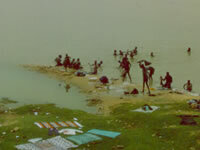 The Niger border guards were really nice, but when we got into town we really thought we had died and gone to heaven. After 10 days in Algeria, subsisting on dates and awful Algerian cigarettes, in the town of Assamakka, every little shack was a store/restaurant, selling major-brand cigarettes, cold beer, Cokes, Coffee. So we stopped and got some lunch, smoked some decent cigarettes and had a Heineken beer! The French guys caught up with us hours later, pissed off, stripped of their last cash. So we pressed on - on to Arlit, where the French guys were going to sell their cars, take a cab to Niamey and get the hell outta there. The piste to Arlit was much easier, so we drove on until pretty late. Finally we veered off the piste and found a decent spot for the night behind some large boulders quite a ways away from the piste. The next morning we decided to split the group. The French guys did not want to arrive all at the same time in Arlit. That way they would not have to deal with selling all five cars at the same time. Andy and I, and two of the French guys with a station wagon and a bachet left most of the water and gas with the other guys and took off on the last hour drive to Arlit. The others were to follow us in about two hours. We drove for about forty Minutes, during which Andy and I became increasingly concerned. We passed some places we both thought looked familiar and the sun was to our right, not to our left. So eventually we signaled the other guys to stop and as we stopped, the guy who was leading us, looked at us and said "I think I fucked up!" as he had also just come to the conclusion that we had indeed turned around and were headed north toward Assamakka. We were practically out of gas and water and worried whether we could still find the camp and whether the other guys were still there. We turned around and headed south for 40 Minutes. We were able to follow our own tracks back to the camp and we were pretty glad to find the other guys still were we left them. They were just starting to get ready to head on to Arlit and quite surprised to see us! They were also pretty annoyed at the prospect of having to wait yet another two hours as the day had gotten blazing hot again. Finally, as we approached Arlit, we hit asphalt again! - right at the entrance to the huge uranium mine just north of Arlit! In Arlit we stopped in front of one of the main Hotels and were immediately surrounded by kids asking if we wanted to sell the cars. The French guys played it "cool" and told the kids to leave us alone. We went inside and had some beers. That's were all the wheelers and dealers hung out. Within 30 Minutes, over a couple of beers they hawked their cars, although not quite for the price they had hoped for. Andy was very interested in selling his truck as well, but he was not prepared to accept the bids he got for it. So we decided to keep going, to see if we could get a better price elsewhere. The French guys warned us that in general the prices tend to decrease as you go south, because people figure you're desperate to sell if you haven't sold in Arlit. After they sold the other cars, the French guys rented a bush taxi and left straight for Niamey. They were done and on their way home. Not so Andy and I. Andy had a real problem having to haggle over his truck via an interpreter (me) in French. And he did not really want to sell the truck. So we decided to continue to Birnin-Konni in southern Niger near the border with Nigeria, where he hoped to be able to sell directly to a Nigerian trader, who were buying most of the cars brought to Arlit anyway. And that way he could haggle in English with the buyer. In the following days we made our way south, and, just as the French guys said, the further south we got the less money we were offered for the truck. One trader from Nigeria said he'd pay half of whatever they offered us in Arlit! 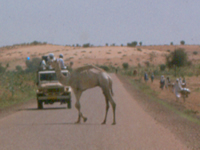 So eventually we made our way into Niamey, where we settled in for a couple of days at the camping grounds. We did a bit of research and re-grouped. We came up with this excellent plan: we'd just keep going - we still had some cash left and our "burn rate" was real low, since we mostly slept on the truck and ate cheap street food. We had found out about a French animal trader, in Lome, Togo, who would certainly be interested in buying snakes from us. Also, we were told, the Togolese beer is the best in West Africa! That day we also picked up a new travel companion. At one point, we saw some little kids throwing rocks at a branch in a tree. Andy went closer to check it out and saw a chameleon on the branch, trying to get higher while desperately holding on, getting pelted with pebbles! We yelled at the kids in German (for maximum effect), and after they scattered, I got the truck. From the bed of the truck Andy was able to reach the chameleon and pluck it out of the tree. The poor, frightened thing turned black and hissed at him. He placed it on the dashboard and we drove off. The little chameleon traveled with us for a while, until eventually we sold it, probably to Toganim in Lomé. The next day we headed south, crossed into Burkina Faso and on to Ouagadougou. We took the detour into Ouaga to satisfy our curiosity. 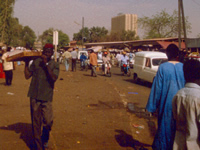 Some folks in Niamey had recommended Ouaga as a pretty, laid-back city. And you never know if we would not find someone who would want to buy the truck. Ouaga was nice, alright, but we got there during the afternoon and it was very quiet. 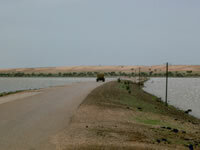 Andy was anxious to move on, so we headed back to Koupela, where the main route into Togo meets the Niamey-Ouaga highway. The taxi station in Koupela is a cool place. We got there after dark, and the place was bustling with people, honking bush taxis, goats and sheep, surrounded by dozens of food stands. We learned that the grilled, spicy chicken is the specialty there, so we had dinner. The grilled chicken really was awesome! After dinner we continued for another short while, until we found a good spot for the night, on a small dirt road, a couple hundred yards away from the road. The next morning we crossed into Togo at the Sinkanse border crossing.